This article is about the Blues Traveler song. For musical "hooks" in general, see Hook (music). (1995) "The Mountains Win Again"
The title of the song is a reference to the term hook: "A hook is a musical idea, often a short riff, passage, or phrase, that is used in popular music to make a song appealing and to "catch the ear of the listener". The lyrics are a commentary on the banality and vacuousness of successful pop songs, making "Hook" both a hit song and a satire of a hit song. The chord progression of "Hook" is very similar to the basic structure of Pachelbel's Canon in D, (D-A-Bm-F#m-G-D-G-A, or I-V-vi-iii-IV-I-IV-V), but transposed to the key of A major. This chord progression is very widely used in popular music, often as the hook, leading to other satirical takes on the use of this chord structure. "It doesn't matter what I say / So long as I sing with inflection / That makes you feel that I'll convey / Some inner truth or vast reflection." The musically "lazy" chord structure viewed in combination with the meta-lyrics reveal the true extent of the song's "genius": "the commentary is a big joke about how listeners will like just about anything laid on top of the chords of the infinitely clichéd Pachelbel canon, even lyrics that openly mock them for liking it." The music video was directed by Frank W. Ockenfels and depicts a man, played by game show host Ken Ober, channel surfing through late-night television. He first watches a beauty pageant whose contestants lip-synch the song as the host interviews them, then a Charles Foster Kane-type politician doing the same at a campaign rally. The band appears in each of these segments, then plays the bridge of the song in the man's apartment, with John Popper taking his place on the couch. During the final portion of the song, the man starts changing channels quickly, often returning to see Paul Shaffer lip-synch the lyrics and play keyboard with the band. Finally the man turns off his TV set and starts to read a book about the American Civil War. Shaffer contributed backing keyboards to "Stand," another track on Four. During the final sequence of channel changes, several split-second clips from the video for the earlier single "Run-Around" are seen. ^ Covach, John (2005). "Form in Rock Music: A Primer". In Stein, Deborah (ed.). Engaging Music: Essays in Music Analysis. New York: Oxford University Press. p. 71. ISBN 0-19-517010-5. ^ a b Guendelsberger, Emily (August 7, 2012). 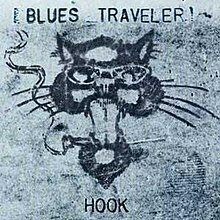 "Why "Hook" by Blues Traveler is actually a pretty genius work of metafiction". The A.V. Club. Retrieved August 15, 2016. ^ "Top 100 Songs of 1996 - Billboard Year End Charts". Retrieved 2017-03-04.